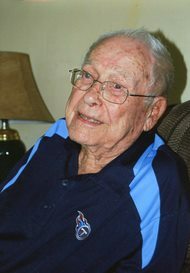 Joseph "J.C." Williamson, Jr., age 97, of Lawrenceburg, TN passed away Thursday, March 21, 2019, at Maury Regional Medical Center in Columbia, TN. He was a retired supervisor from Murray Ohio and a member of College Place Church of Christ. Mr. Williamson served his country from 1942-1945 in the U.S. Navy during World War II. Born Friday, November 4, 1921, in Ethridge, Tennessee, he was the son of the late Joseph C. Williamson, Sr. and the late Lena Felton Williamson. He was also preceded in death by his wife, Bonnie Brown Williamson; son, Keith Williamson; brothers, B. L. Williamson and Felton Williamson; and sister, Ethelyn Sink. Surviving are son, Steve Williamson (Barbara) of Lawrenceburg, TN; sister, Betty Abernathy Bates of Lawrenceburg, TN; grandchildren, Kevin Williamson (Marla) of Lawrenceburg, TN and Scott Williamson of Nashville, TN; great-grandchildren, Lexi and Megan Gower; several cousins, nieces and nephews. Arrangements are being handled by Neal Funeral Home, 231 N. Military Avenue, Lawrenceburg, Tennessee. The family will receive friends from 5:00 PM to 8:00 PM Friday, March 22, 2019 at Neal Funeral Home. Funeral services will be conducted at Neal Funeral Home at 1:00 PM Saturday, March 23, 2019. Interment will follow at Lawrence County Memorial Gardens in Lawrenceburg, TN.